Receive EVENT updates. Privacy guaranteed. is said to be a Spanish corruption of the O'odham phrase "s-cuk ba'a", or perhaps "cu wa", meaning "black water" or "low place", respectively. Tubac is situated on the Santa Cruz River. What we now know as Tubac, Arizona was at first a Spanish colonial garrison, or Presidio. It was depopulated during the O'odham Uprising in the eighteenth century. During the nineteenth century, the area was repopulated by miners, farmers and ranchers. Civilization was slow to arrive in Tubac due to the depredations of the Apache. The town of Tubac is best known today as an artists' colony. Established in 1752 as a Spanish presidio, the first Spanish colonial garrison in what is now Arizona, Tubac was one of the stops on the Camino Real (the "Royal Road") from Mexico to the Spanish settlements in California. 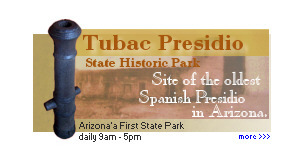 Tubac's most famous Spanish resident was Juan Bautista de Anza. While stationed at Tubac (1760-1776), de Anza built the chapel of Santa Gertrudis, the foundations of which lie beneath today's St. Ann's Church. The remains of the old Spanish presidio are preserved by Tubac Presidio State Historic Park. The park also features a regional museum, an underground archeology display, and other historic buildings. California gambler and highwayman Jack Powers was murdered in Mexico in November 1860, south of Nogales, and his body fed to a pen of starving hogs. The uneaten part of his corpse was buried in the Arizona Territory south of Tubac. Tubac was the scene of a three day siege in 1861, between Tubac's male population, Confederate militia and Apache warriors. The Siege of Tubac was a part of the Apache Wars between settlers, militia of Confederate Arizona and Chiricahua Apaches. At the time of the battle, Tubac was a part of the New Mexico Territory. fought the Apaches for three days until sending a dispatch rider to Tucson, requesting reinforcements. Apache warriors, over 200 strong, attacked Tubac sometime in early August and initiated a siege on one side of the town. Mexican bandits occupied the other side but stayed out of the major fighting. A force of twenty-five militiamen, carrying a Confederate Flag and commanded by a Granville Henderson Oury, arrived at the town and fought off the final assault. The Apaches withdrew out of close range but continued to lay siege by stopping the ability of the militia to escape. Eventually, food and ammunition became short and the garrison, along with the women and children, chose to flee to avoid being massacred by the overwhelming Apache army. The Arizonans escaped successfully after another skirmish on the last night, leaving Tubac to be burned by the native army and plundered by the Mexican bandits. The Americans headed back to Tucson, to the north, having completed their objective of rescuing the besieged Tubacans. The Tubacans, with their town virtually gone, left Tucson at about August 15, 1861. Their destination was the Rio Grande River, east of Mesilla. Before completing their journey, the Arizonans would be attacked again by Apaches, this engagement is known as the Battle of Cooke's Canyon. The battle in Cooke's Canyon resulted in the Battle of the Florida Mountains. The casualties of the engagement are unknown. Tubac was left abandoned into the 1880s. By 1908, Tubac was being rebuilt but still had a very small population of fewer than 200. As of today, roughly 100 years later, only about 1000 people reside in the town. The Apache Wars were fought during the nineteenth century between American settlers, the U.S. and or C.S. Army and many Apache tribes in what is now the southwestern United States. lasted from 1851, with the arrival of American settlers, to 1886, the year Geronimo surrendered. However, Apache attacks on white and mexican settlers continued as late as 1900. Some historians group the Apaches and Navajos together because they have similar languages (Athapascan) and cultures. In the early years of the wars, the Apache war battles were often the result of stolen property and massacres of whites and Mexicans. The early years were from roughly 1851 to 1875. The latter period from 1875 to 1886, during which time the United States engaged Apaches in order to settle them on reservations or to keep them from escaping the reservations. With the capture of Geronimo in 1886, the period then on to 1900 was a time of small skirmishes between white settlers and little packs of Apaches who evaded the U.S. Army's reservations. Much of the time, individual Apache warriors were reported to have made attacks. Sometimes the Native Americans were provoked by white and Mexican settlers, speculators of the federal Indian Reservation policy. Apache leaders like Mangas Coloradas of the Bedonkohe, Cochise of the Chokonen, Victorio of the Chihenne band, Juh of the Nednhi band, Delshay of the Tonto, and Geronimo of the Bedonkohe, led war or raiding parties against non-Apaches and resisted the military's attempts, by force and persuasion, to relocate their people to various reservations. At the start of the Mexican-American War in 1846, many Apache bands promised U.S. soldiers safe passage through their land. When the U.S. claimed the former frontier territories of Mexico in 1848, Mangas Coloradas signed a peace treaty, respecting them as conquerors of the Mexicans' land. An uneasy peace between the Apache and the now citizens of the United States held until an influx of gold miners into the Santa Rita Mountains of present day Arizona, led to conflict. Here is our Site Map.